A Skeleton is a hierarchy of bone locations and rotations used to deform a Skeletal Mesh. In UE4, Skeletons are abstracted from Skeletal Meshes in their own asset. 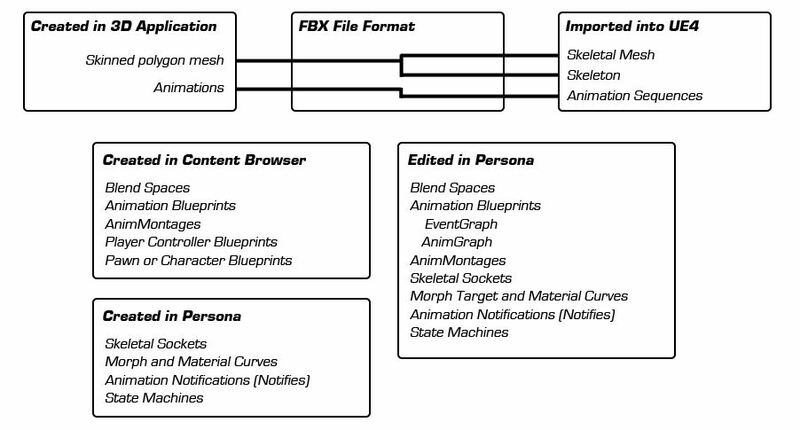 This means that animations are applied to the Skeleton, rather than the Skeletal Mesh. 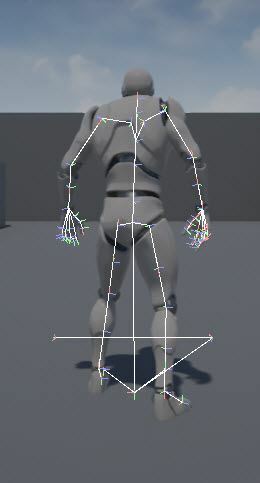 By using the same Skeleton, multiple Skeletal Meshes can share animations. Animations can be used as absolute or additive at any time. The system performs the appropriate calculations to convert the data to offsets when necessary. This makes the system much more flexible than that of previous versions of the engine since you do not have to specify ahead of time that an animation is to be considered additive. Animations can be blended together to create more complex final poses through the use of 混合节点 and 混合空间 . 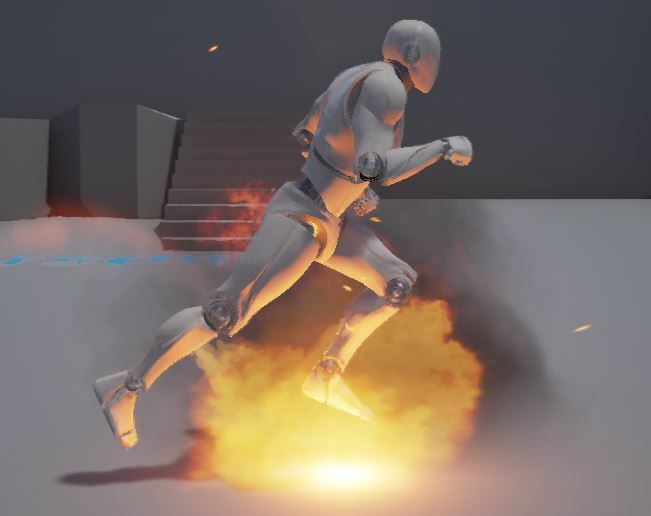 For instance, a running animation can be blended with aim poses or facial animation to create an output animation of the player running and aiming or talking at the same time while being able to keep the source animations separate. This allows for the reuse of a single source animation in many circumstances. It is as if the mesh, via the underlying Skeleton, has been posed. The data that represents the transforms of all of the bones in the Skeleton is what makes up the actual Animation Pose. Some AnimationSequences are designed purely to be used as poses. For instance, you might have a series of short one- or two-frame animations that simply define a pose. The pose below is from this type of Animation Sequence, which is designed to be used to cause the mesh to aim its weapon where the player is looking. 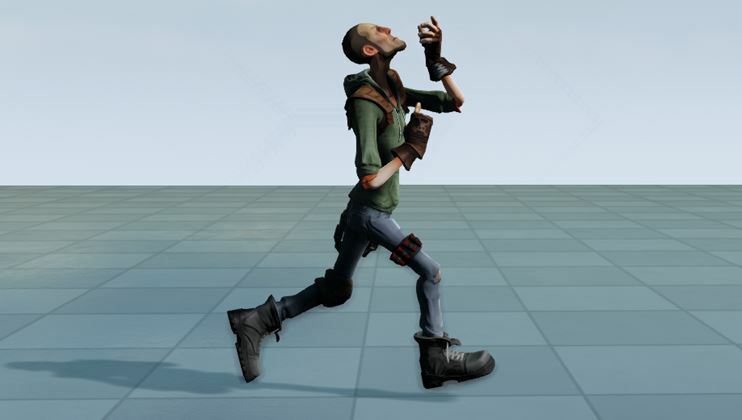 The Animation system uses this concept of Animation Poses within the AnimGraph. The data output from an AnimationSequence, Blendspace, or simple blend node is an Animation Pose, or snapshot of the animation up to that point, to apply to the SkeletalMesh. The following is a simple breakdown of where certain parts of the animation system are created and edited. 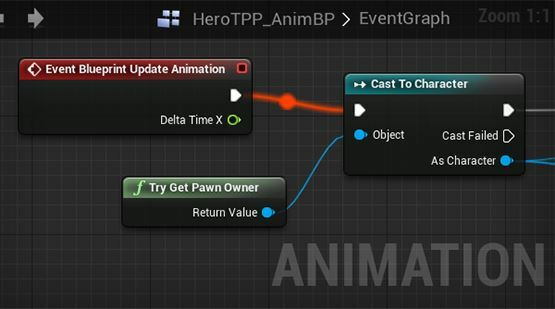 This diagram illustrates the flow and ownership of data for a typical animated character in Unreal. 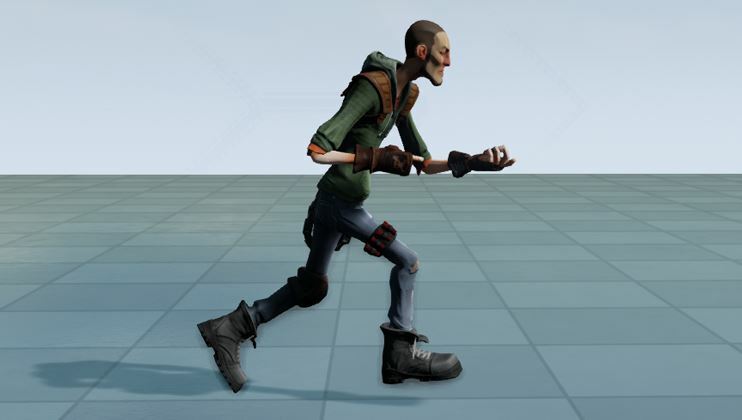 A practical application of the animation system and its features are on display inside the Animation Content Examples page. Here you will be able to follow along by looking at bite-sized examples of each feature along with additional details. For more information on Content Examples and how to use them, refer to the Content Examples Overview page. Debug features can be accessed by pressing the ` key to bring up the console while in play mode. To display the Skeletal Mesh Bones, enter the ShowDebug Bones command inside the console. As seen in the image above the bones are represented by individual white lines. The ShowDebug Bones command will display the information for the playable character during a play session. 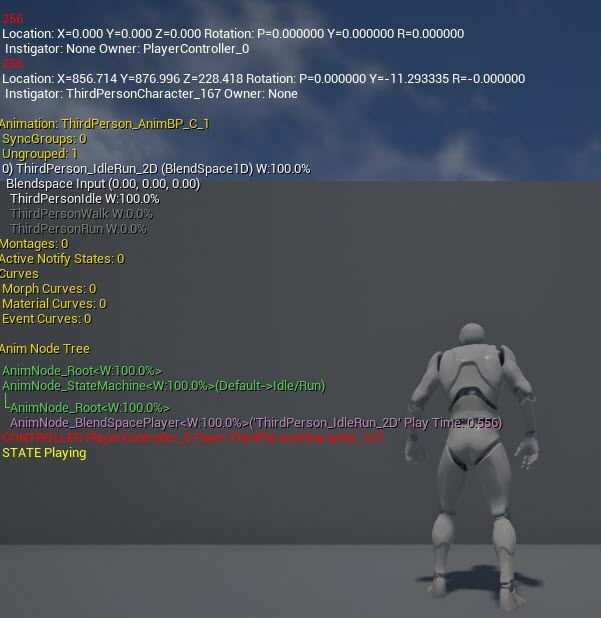 To view the debug animation for another character (other than the player character), you can use the viewactor ExampleCharacterID command, where ExampleCharacterID refers to the Character ID assigned to the character you wish to view. You can find this ID by hovering over a character in the World Outliner which will display its ID name. At this time when using the viewactor command, the camera will be moved to and locked on the Actor you are currently viewing. If you need to manipulate the camera while debugging still, a work around for this is to create a Play in Editor session with more than one player from the dropdown menu using one window for debugging and the other for controlling a player character. An alternative look, matching the bones displayed in Persona, can be enabled by entering the ShowDebugToggleSubCategory 3DBones command inside the console. The Animation Debug Output information can be enabled by using the ShowDebug Animation command inside the console. The information displayed is split up into 5 sections, each of which can be toggled on and off using the ShowDebugToggleSubCategory command followed by the category name listed below (e.g. ShowDebugToggleSubCategory SyncGroups). SyncGroups Displays the animation assets currently contributing to the final pose, organized by their sync group (or Ungrouped if they do not belong to a group). By default Blendspaces listed in this section show all their contributing animations/weights. To reduce screen space used by the output this can be toggled off with ShowDebugToggleSubCategory FullBlendspaceDisplay. Montages Lists the montages currently being used by the character. The active montage is highlighted in green. Curves Lists the curve values (in Name: Value pairs) that have been activated by the playing animation(s). Notifies Display any notify states that are currently in effect. Graph Displays the active pose graph. The display starts with the last node (the root node) which represents the final pose and goes on to list all the nodes that go into making that final pose. Nodes are represented in such a way as to keep their hierarchy, allowing the user to see which nodes are connected to what without having to refer to the original Blueprint asset. Active nodes are colored green and (if they have been toggled to display using ShowDebugToggleSubCategory FullGraph) inactive nodes are colored grey.